Can Your Agent Really Help During a Claim? 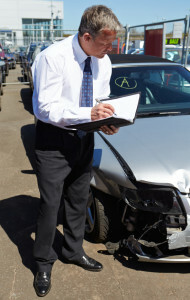 Home » Insurance » Auto Insurance » Can Your Agent Really Help During a Claim? Insurance of all kinds – auto, home, life, boat – is complicated. It is nice to have an experienced voice there to guide us through the decision making process. Having an insurance agent isn’t a terrible idea because they can make you aware of risks you would not have considered normally. However, many insurance companies play up the fact that talking with a real human being in person at their office is a great perk for you. Many commercials on television show agents coming to the rescue of their insured clients during accidents or disasters. But can your insurance agent really help you during a claim? If you are in a car accident, your first call should not be to your insurance agent. Instead you should call the number on the back of your insurance card. That number will have you calling into a claims call center where phone agents will take down the details of the accident and advise you on next steps. Having a local friendly face is a nice thought, but your insurance agent’s job is to sell you insurance. They are not really involved in the claims process. Granted, having someone local whose office you can go and talk in person with is nice. But their role in a claims situation is more a listening ear or a shoulder to cry on. They can tell you what steps to take, and if you are really frustrated with the claims process there is always a special agent-only claims line to help move the ball along. But that’s about the only thing they can do, and at the end of the day they are calling the same claims center that you would call. They aren’t making the call as a favor for you per se, they are trying to protect their book of business and hoping you don’t leave their agency thanks to the call center’s poor service. If you remain assertive with the call center yourself, there is no need for the agent to get involved. That having been said, agents suddenly look to be expensive commodities in the insurance business. If you can handle talking with the call center personnel (and their supervisors) yourself, your agent doesn’t get involved. They get to collect a commission off of selling you insurance, and not getting involved on the service side. So do you really need an insurance agent? Compare insurance quotes from an in-person agent and from an insurance company that doesn’t have corporate-sponsored locations. You are likely to find the web-based insurance agencies (or those that utilize independent agents that quote multiple companies for you) have lower rates than the insurance firm that has a branch just down the street from you. Your insurance agent’s office is expensive. You have the salary and commission of the agent, the receptionist’s wage, and overhead like rent and utilities. None of those items are free. You won’t see a line item charge on your insurance premium for “ paying for your insurance agent’s lifestyle”, but the insurance company charges you in some way to pay for the agent. You are paying for the middleman when you could go direct to another company. If your insurance agent provided significant benefit for those in-person or local conversations, it might be different. But there isn’t much an insurance agent can do for you that you can’t do for yourself. And hopefully you aren’t planning on needing a lot of claims assistance every year! Try getting an online insurance quote to see if you are overpaying for insurance.